Motorcycle helmets are made to protect but not all Helmets are made equal. If you are a bike enthusiast like me then you can agree with me that a motorcycle helmet is as important to a biker as a seat belt is to a driver. Now you are wondering which helmet is the one for you. The internet of things has made old helmets boring. Now everyone wants Best Bluetooth motorcycle helmet. Purchasing a Top Bluetooth Motorcycle Helmet is not as simple as buying candy from a store. There are certain factors that affect your purchase of a helmet like; weight, size, visibility, ventilation etc. We took the liberty of testing out different brands of Bluetooth helmets and put together a list of the Best Bluetooth Motorcycle Helmets. So without wasting further any time let’s get started. They say quality comes at a price so the first on our list is a helmet that packs lots of features for a price. The Bell Qualifier DLX helmet has almost everything you will find in a more expensive helmet. 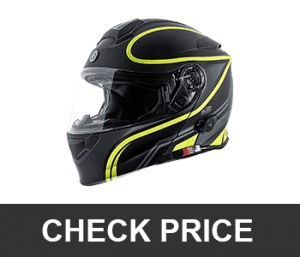 Gleaned directly from the Bell flagship star line this helmet delivers exceptional performance at an incredible value. The Qualifier DLX comes in a lightweight polycarbonate shell which is touch and can withstand heavy impact in a crash. It is fully decked with aggressive styling, anti-scratch face shield, NutraFog ΙΙ anti-fog, removable, washable liner, a padded wind collar, integrated speaker, and VelocityFlow ventilation. And yes it has an integrated port for Sena and Cardo stereo Bluetooth communications. This helmet has a lot going for it but the question is, why pay more? Well because rarely will you find a full-face helmet with a transitions photo-chromatic face shield and also the ventilation system is one of if not the best you will find in a full-face helmet. So should you consider it or should you buy it? 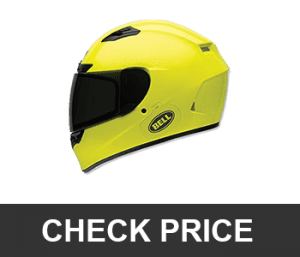 The helmet is on the expensive side but considering the number of features, the Bell Qualifier DLX has I’d say the price is justified. If you have the cash to splash on a flashy and functional helmet this is one hell of a helmet, so YES buy it. Need I say wearing the black color helmet together with a matching black leather jacket made me look and feel like a jet fighter pilot than a motorcycle rider. The icing on the cake is the five-year warranty. You don’t find that these days at that price range. However, you will have to incur additional cost to buy adapters to accommodate either the Bell Sena SMH10 or the Cardo Scala Rider Q1/Q3 Bluetooth stereo and intercom system, but like I said before quality comes at a price. Need I mention the Bell Bell Qualifier DLX is best suited for long rides and adventurous trips. The ILM Bluetooth integrated modular flip up is a helmet with a slick design and comes in Black, White and Red colors. It has a modular flip-up face shield with a comfortable microfiber lining (which is removable) and has adjustable vents for fresh air (very useful in the summer). Its one-touch control system for changing tracks, activating GPS audio and answering calls makes it easy to switch from one setting to the other while riding. Need I mention it is ECE and DOT certified as well as a durable and lightweight build. However, the external visor of this helmet doesn’t have anti-fog properties making it not very suitable for low visibility, foggy weather conditions. Gleaned directly from the Bell flagship star line this Bluetooth helmet delivers exceptional performance at an incredible value. The Qualifier DLX comes in a lightweight polycarbonate shell which is touch and can withstand heavy impact in a crash. This helmet is for light sports motorcyclist, People who live in hot areas as well as areas with sandstorms. It’s reliable, fairly priced and you get good value for your money. Just don’t take it out for something extreme. Furthermore, it offers 8 hours of talk time or listening to music which is great for those long and lonely rides. So should you buy it or should you consider it? I reckon you consider buying it. Bilt Tecno 2 has a superior quality metallic finish as well as a lacquer or double flat matte finish. It is equipped with the SENA DWO-5 Bluetooth technology out of the box. As the name suggests the helmet syncs easily with Bluetooth enabled devices and offers many features. It is available as a flip-up or full-face helmet. However, the Bilt Bluetooth helmet sizing is slightly off. What I mean is the size Large is listed as fitting (59 – 60cm head) but it feels more like a 58cm (which is the upper end of a medium). Firmware and device setting updates. So who is this helmet for? 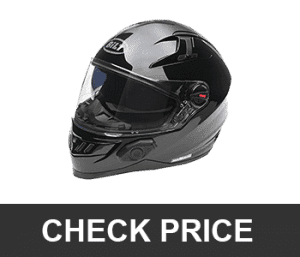 The Bilt Techno 2.0 Bluetooth Helmet is for people that have a decent budget for a full-fledged feature packed motorcycle helmet. In the land of the Bluetooth motorcycle helmets, the freedConn flip-up helmet has you covered with its high-tech and cool looking helmet. This Bluetooth motorcycle helmet has a lot going for it. The intercom system allows you to connect up to 3 helmets with a communication range of up to 500m, that’s very impressive and thus, suitable for a group trip. The modular flip-up design means you can flip it up for more ventilation, very handy in hot weather conditions. The shell is ABS. This means it offers very good protection and you will be able to use your helmet in all weather conditions (hot or humid conditions). Looks isn’t the only thing that makes this Best Bluetooth motorcycle helmet. Let’s dive into the features, shall we? However, this Bluetooth motorcycle helmet isn’t without its faults. When we used the FreedCon flip-up we found out that although the shell is a solid build, the padding around the forehead area becomes uncomfortable when you wear the helmet over very long periods. The use of lithium-ion battery means you will have to buy a replacement from time to time and this is an additional cost. So should you buy it or should you consider it? 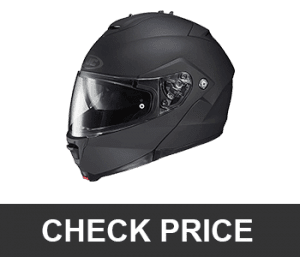 If you are someone that relies on your motorbike for transportation or you just want a cool looking helmet, you should definitely get the FreedCon flip-up helmet because it is a good value for money. This is another exciting Bluetooth modular motorcycle helmet. It is available in the following colors Metallic-silver, Gloss-Black, Gloss-Whit, Matt-Anthracite, Wine-Cherry, and Matt-Black. This Bluetooth motorcycle helmet looks a little bit bigger on the outside than most helmets I have tested. If you often ride in sunny conditions in the day and at night then you know that sunlight in the mornings and car lights that go directly into your eyeball can be a nuisance. Having two visors can be a chore to carry, remove and replace. The HJC IS-Max II has a built-in flip-down internal visor. This Bluetooth motorcycle helmet solves the problem of using two separate visors. This feature came in handy on the third day of using this helmet. As it happened I was out testing the Bluetooth feature when all of a sudden at a stop light some other motorist decided to race me down the quarter mile. Needless to say, I won the challenge but I was aided by the sun. This is because the weather had changed, the sun was shining bright and all I had to do was flip down the internal sun shield of the HJC IS-Max II to protect my eyes. Later at a motorcycle supply store, I realized his helmet did not have a sun shield. So what do I think of the HJC IS-Max II? For starters, its cheap rings most of the bells & whistles of a helmet. Overall, it is a good value for money. However, to enjoy full Bluetooth and intercom connectivity you have to opt for the J&M high performance integrated Bluetooth and corded headsets which are custom installed. This Bluetooth motorcycle helmet integrated corded headsets have a small scale high-output AeroMic boom microphones, (which is tuned for use with all factory installed motorcycle audio system), with an 8-pin two piece hook-up cord system (upper cord included only with headset) that lets you connect your headset to any factory installed motorcycle audio system including the new 2014-2018 Harley infotainment systems and Honda GL-1800 premium audio, but you will have to interchange the lower section hook-up cord. N/B You will incur additional cost on the above-mentioned additions. Moreover, the vents on the HJC IS-Max II seemed to be useless. At first, I didn’t notice it but after in-depth testing, I realized the air comes in through under the chin. It’s not a deal breaker as it comes with a wind deflector but rarely did I use it. So should you buy it, or should you consider it? I reckon you consider it. The version we tested was the top tier model of the lineup which had all the intriguing features and will cost you a bit. When I heard about the new Hawk H7000 Glossy Black helmet I was excited to try it out because I had the previous model the H-66. For starters, this Bluetooth helmet comes with Bluetooth directions, a new cord charger, and a helmet cover. Unlike the H-66 the Bluetooth on the H7000 can connect to two devices at once. It transitions smoothly from one device or task. What I mean is if I was listening to music from my iPhone via Bluetooth and received a call and after answering the call it switches back to the music effortlessly. As for the audio sound and quality, it is fine at 80MPH but maxes out at 90MPH and above. That is at speeds exceeding 90 MPH I could barely make out the words of a song all I get is the melody and beat. It doesn’t mean the audio quality is bad, oh no it is fine, it’s just that at high speeds there is too much outside noise interference. The speaker placement on the H7000 is lined directly with the ears and not on the chin strap like on the H-66. In my usage, the battery life didn’t last the 8 hours of continuous play as the manufacturer claims. The best I got was 6 ½ hours with the volume at 50%. The ventilation on the H7000 is a big step from the H-66. If you have used the H-66 then you know it can be a microwave. Moreover, my neck is on the small side and I often go for long rides so helmet weight is a deal breaker for me but I am satisfied with the overall weight distribution. There are some issues with this helmet. Unlike the H-66 the cord does not come with a wall plug you will need a standard Bluetooth wall plug in to plug in the cord. I got a very small amount of raindrops licking from the top of the visor but it could be because of the top vent was partially open. It’s not an obvious issue maybe my test unit had a slight defect. As always most helmets have a problem with sizes. No two heads are of the same size or shape. I do not have a big head but Hawk helmets often tend to be smaller I had to return the first test unit which was a medium and got a large instead. Overall the Hawk H7000 is a Massive improvement from its predecessor the H-66. But is it really different from other Bluetooth modular motorcycle helmets out there? Not really. The Hawk H7000 doesn’t bring any groundbreaking feature if anything it is playing catch-up instead. If you just want a helmet that has standard features at an affordable price, then yeah go for it. The next series of Bluetooth motorcycle helmets will come from one brand TORC. TORC is one of the lesser known helmet brands. It has brought new features in the low and mid-range helmets. It is also known for its revolutionary helmet designs. When you are a biker, looks and safety is not your only concern. These days’ bikers want more from their helmets and it’s safe to say TORC has you covered. It should be noted that features such as Bluetooth connectivity, taking calls or using the intercom while riding. With other manufacturers, you pay extra to get these. The most striking and beneficial feature of the TORC TB27 helmet is the Bluetooth connectivity. This helmet has most or all of what you will want in a Bluetooth modular motorcycle helmet. The design, styling, and comfort are superb. Chin & top vents with venturi exhaust vents at the back. So should you buy it or should you consider it? 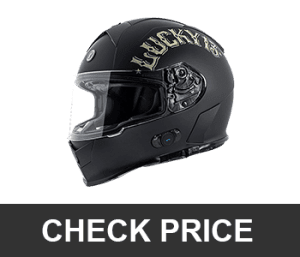 There is no doubt that for a low to mid-tier helmet it has more features compared to similar offerings from other manufacturers. For the price, it’s a bargain. I reckon you consider buying it. The TORC T14B is a full face motorcycle helmet with Bluetooth. This Bluetooth helmet has a solid and reliable build. It weighs 2.5kg (5pounds). It comes in various colors like flat, flat grey nuke, flat white, flat white bad kitty, flat black, and flat black flag. This helmet was designed to stay in one piece and provide maximum head protection upon impact in the event of a crash. The TORC T14B is equipped with a Bluetooth integrated shell. Motorcycle helmets can be loud at high speeds but the T14B manages just fine. The thickly padded inner liner makes it comfortable to wear and is specially contoured for people with oval shaped heads meaning it will be a good fit for most riders. So if you know you have an oval shaped head and need a helmet voila. 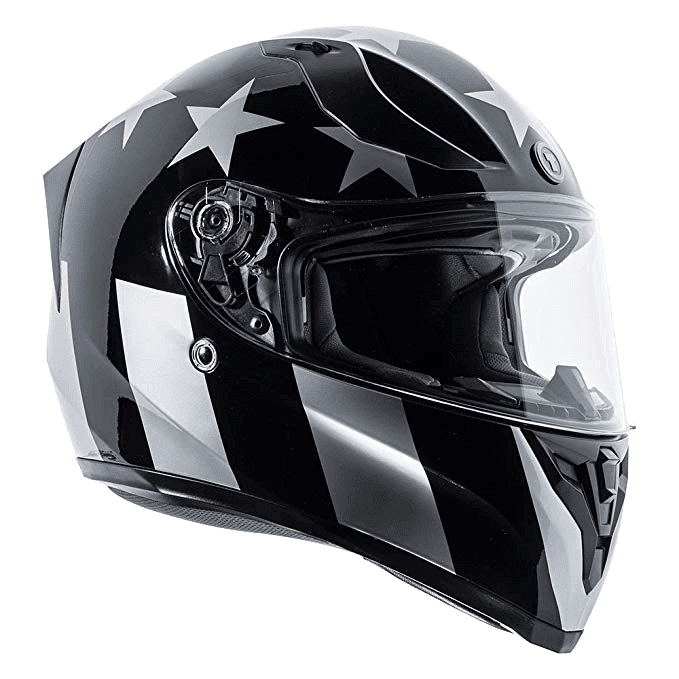 The overall helmet design is simple but the black color is cool and when I wore the helmet together with my black leather jacket, black denim jeans with brown Alcan Tara boots I looked like a Power Ranger. The TORC T14B Bluetooth integrated full face helmet overall is a beautiful helmet with good protection and advance Blinc Bluetooth technology. However, there are some issues with this helmet. I found out that the visor will fog up in extreme humidity, so cleaning it with a scuba diving grade visor defogger like 500 PSI, SeaGold, or Quick Spit, is a must for people living in Florida. The sun shades are good but could be a little bit longer. The nose bridge guard, chin curtain, and rear pads like to come loose, so they need to be adjusted frequently. I like its oval-shaped small size, its rigidity, and the black color gives you that fighter jet pilot look. So if you have an oval shaped head this is one helmet you should definitely consider. If you got the cash buy it. 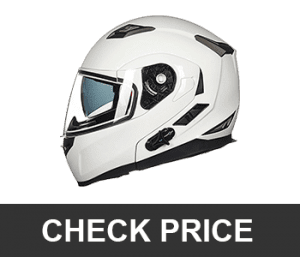 The TORC T10B is a sports bike helmet concept that packs all the necessary features into a stylish, cool looking helmet at an affordable price, adding Bluetooth technology for amazing hands-free communications. The helmets shell has a built-in rear spoiler, is aerodynamically designed as well as with fully adjustable chin vents and forehead for dynamic airflow to keep you comfortable regardless of the weather. This gives you the freedom to focus your attention on the road ahead of you. The T10B Prodigy’s soft, comfortable, fully removable and washable inner liner will make you forget you have a helmet on your head. It comes fully equipped with two speakers, up to 8 hours of continuous talk time with 150 hours of standby time as well as an improved Bluetooth 2.0 technology for compatibility with your other Bluetooth enabled devices like your mobile phone. The T10B allows you to stream and listen to music from your phone or radio, GPS directions, send and receive calls (calls on most Bluetooth enabled helmets automatically override other communications, but the new call reject feature limits interruptions). The intercom system enables superb communications between rider and passenger and vice versa or a two-way communication with another rider within 30.5 meters. There is a noise canceling mic, self-adjusting volume, glove friendly and waterproof controls as well as full duplex communications with DSP filter. Although overall this is a fine helmet I had some unexpected issues with it. First of all, to turn the helmet on or off requires holding the button for 6 seconds that’s longer than I expected. Also setting up the Bluetooth with my iPhone was infuriating but after pairing and repeating the pairing process again it paired just fine. The speakers do really sound cheap to me. Don’t get me wrong it’s decent but not great. Occasionally I had to use my SONY earphones. Overall it’s a well-built helmet, looks awesome, the sun visor is the perfect tint and it’s very comfortable. So should you buy it or should you consider it? Well, I reckon you buy it. The T28B is an intermediate oval shaped modular helmet with a unique combination of style, comfort, and sportiness. This Bluetooth motorcycle helmet has a built-in spoiler to reduce or eliminate wind buffering and improve stability at high speeds as well as a one-button latch system with flip down sun visor for those sunny days. The soft padding inner liner and flow through ventilation system ensures that you are comfortable on those long rides. Incoming phone calls override music, intercom or GPS audio and call termination resumes intercom, music and GPS audio. The intercom range between riders is 1500feet or 457.2m. Overall the helmet is a good helmet for the price but it’s not great. It does what a helmet is supposed to do. I do not have any serious complaints about it. For the price, I’d say you should definitely consider buying this helmet. It is a good value for money. As of now, you are probably familiar with how Bluetooth motorcycle helmet work. So before buying a Bluetooth helmet, it is important to think about the following. Most often when we want to buy something the first question that comes to mind is how much does it cost. 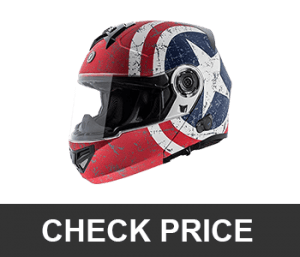 So before you go out to buy that helmet you so desire, it is important to have a budget range as opposed to a specific amount. 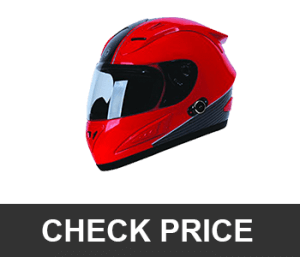 Also, the variation in prices will depend on the type of helmet you are looking for. If you already have a compatible helmet then all you need is to buy a Bluetooth intercom system and install at a cheaper rate. 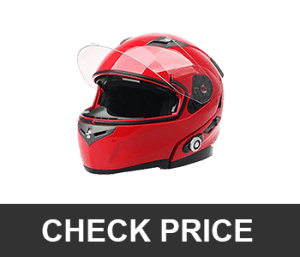 In contrast, if you are buying a completely decked out Bluetooth motorcycle helmet then be prepared to spend more. Phones can be paired with Bluetooth enable helmets for answering calls, play music, GPS, as well as using audio features of the phone. 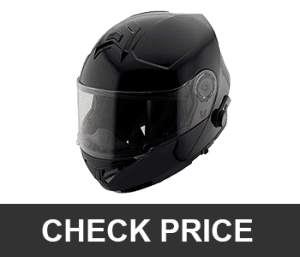 Most Bluetooth motorcycle helmets enable voice connectivity for receiving calls and voice dialing.With the exception of some iPhone models, most Android phones have apps that allow your phone to hook up with a Bluetooth system. Navigation control is an integral part of anyone riding a motorcycle or driving a car. Bluetooth motorcycle helmet technology gives rider’s in-ear turn-by-turn navigation giving riders the cutesy of not fiddling with navigation maps or dials of any sort. So before you buy a Bluetooth helmet ensure that the GPS has this functionality. Most often you will find good deals on second-hand Bluetooth motorcycle helmets but you have to inspect it properly. If you find someone that wants to sell their old helmet, use the opportunity to test it out. However, if you’ve got the cash to spend on a new Bluetooth motorcycle helmet then it will be better to buy a new one. Bluetooth technology now has the capability to allow up to 10 riders to chat with good reception and sound. It is somewhat similar to being on a conference call where there are many people on the line, everyone can hear and can speak at the same time. If you often ride in groups make sure you ask about this feature and how many riders can be paired. It is important to verify a helmets ability to reduce sound noise and volume if you want to hear the sound inside your helmet. Some helmets come with an audio booster. This is an important feature to have especially if you have an open face or half helmet because there will be more noise coming in compared to a full face helmet. Riding and listening to music is not new. However, you need a Bluetooth headset that will connect to different devices and allow you to listen to your smartphone, MP3 player and some helmets give you the chance to stream your music to your friends riding alongside you. Fun fact; did you know motorcyclists are more likely to experience a deadly accident while riding than those driving a car? Deciding on which helmet to buy depends on the individual like I said before “no two heads are the same”. “One man’s garbage is another man’s treasure”. My point is everyone’s choice is different. So picking the right helmet is essential for your safety and in compliance with the law. A helmet can be the difference between life and death in the event of a crash. Follow the guides lines provided above and stay safe.